I must show you our Tuesday evening's meal, the pizza and salad. Maggie commented she felt salad was too chilly a meal for winter, but we do like salad at least a couple of times a week all year round - and more often obviously in summer. I splashed out an bought an avocado because I love 'em in a salad. 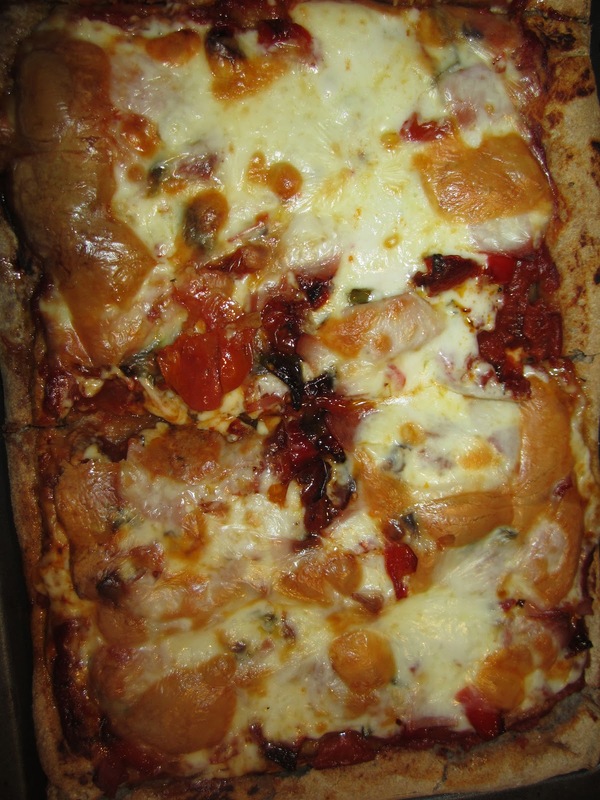 The pizza was the roasted cherry tomatoes and mixed peppers I wrote about last time, with some slicing mozzarella. Delish! I must also show you my corner pantry cupboard after its clear-out! I know, it's really sad getting excited about pantry cupboards, isn't it? I should get a life. I must say this corner pull-out thingy is worth it's weight, no more scrambling about in the depths of a dark inaccessible corner. But my favourite is the tall larder cupboard (see last post) if my kitchen were larger I would have two of these. Inside is for duplicate ingredients or large jars of things. The door shelves hold milk, tea, and plain /self raising/ and bread flours. Oh and porridge oats. In the corner of the inside you can see a collection of small containers ... you wouldn't believe how much bicarb of soda, baking soda and cream of tartar I had accumulated! All now out of date so it is sitting there to be used to clean my sink! And the up to date stuff is in my newly cleared out baking drawer, with the yeast, vanilla and almond essences and baking paraphernalia. Yesterday started out beautifully. I had my box lesson with lovely Nick Wiseman-Ellis, who is doing a gig on Sunday (St Patrick's Day) at The Rumsey Wells in Norwich if you are handy, 3-7 pm appearing with Copperplate. I love my lessons, they always unscramble my head of whatever has been bugging me, and despite giving me teeth-grittingly challenging moments I always drive home with a big grin on my face and music playing in my head. I'm so pleased I took advice and collared Nick for lessons - he came very well recommended - as I do feel I'm making progress; I should have done the same with my fiddle, but I fear I am beyond help with that! Anyway, after that I hopped across the city to Chapelfields, for my One-to -One at the Apple store, I am learning SO MUCH about my lap top! They've sorted out all my iphotos (erm ....12,000 and counting!) and shown me so many short cuts. Then I was done, ready for home ...and realised I had no idea where in the big, two-story car park I had left my little Ford Ka! Do you know how many blue cars there are these days? I have seen most of them while I wandered round and round getting increasingly more anxious ...would my ticket run out before I found it? Eventually I found an office near the exit and a lovely young lad came and helped me find it. Phew!! Sorta took the edge off my happy-feelings for a while there! Just before I left Norwich I popped into Staples and made a purchase. D'you think this is a bit over the top? It's a dry-wipe board for my weekly menus. It won't live here, it's going up on the wall next to the door under the book shelves. And I can jot down what ingredients I need to buy - not many as we are living out of the freezer and pantry at the moment, saving squids! And look! It's got a little pin-boardy bit at the bottom! ( Oh DO get a life, Lynne!!) Yes, it is a bit Martha Stewart isn't it? But anything that keeps me organised has got to be good. Oh dear, if you've come to read about textiles you are fresh out of luck, again, I'm sorry. But if you care to scroll back through earlier posts there is LOADS of stitchy stuff. I tried to do that link thing with 3 previous posts pictured at the bottom of your post, but it doesn't seem to have worked. (Yeah, still the same old non-techie me, despite the Apple sessions!) If any of you use that facility, do let me know how it works.) Catch you next time, and hope if you haven't got warmth then at least you have some sunshine to brighten your day. For you lot in the Antipodes, I hope it pours down soon for you. A good clear out always makes you feel better doesn't it. Having made the comment about salad, guess what I had yesterday, and for my lunch today? Yep, you guessed it... only mine was smoked mackerel (trying to introduce more beneficial bone-wise foods as I am trying to 'treat'my newly-diagnosed osteoporosis the more natural way), beetroot, cherry tomatoes, crispy salad leaves and good potato salad. I love the combination of smoky salty from the fish, sweet from the tomatoes and beetroot, and the creamy potato salad contrasted with the crispy leaves. Yummy. 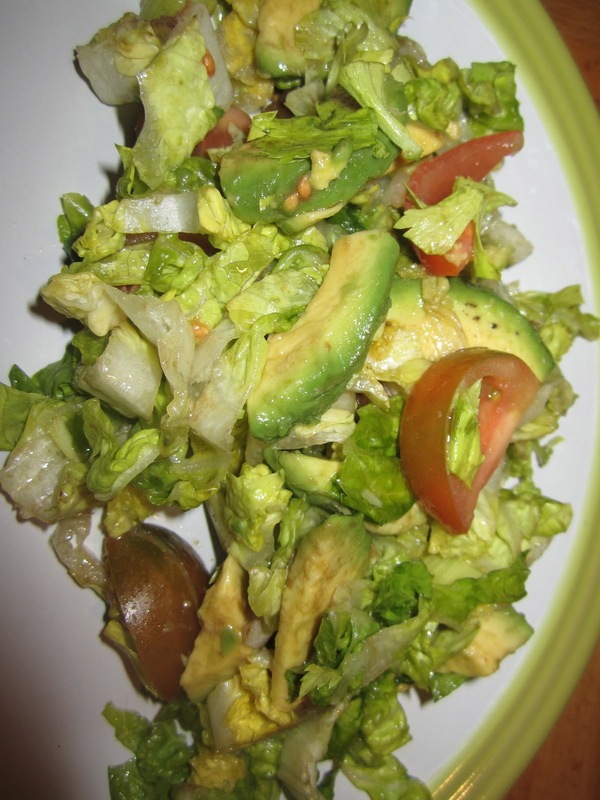 I don't eat salad every week, but thinking about it, probably more than I thought! And I love the menu thingy... mine consists of a scrap of paper whereon I throw down ideas to choose from and it lives in a pretty bowl where I keep napkins. Not as tidy as yours though. There you go! You enjoyed it! We like smoked mackerel too, I bet it was lovely. Just goes to show you're never too old for a bit of self-improvement!!!!!! Gorgeous tulips, and I rather like your meal planning board! See above comments on MPBoard! We have a menu board too - ours is a chalkboard type. It's so helpful! Your Pizza looks delicious and the Tulips are stunning. Hi Lynne, All I have to say is, that all those people that put down the food in the UK have never eaten at your house. Yum!!! What time do you want me for dinner? I love your little eraser board, too. Very cool idea. Hi Connie, I do enjoy cooking, and think i'm a reasonably good plain cook. I think the reputation Britain used to have is a bit outdated now, some excellent young chefs coming up, some great restaurants and our old-fashioned country pubs often do really brilliant meals. ps you'd be very welcome! I am always trying new ways of menu planning. I've found that whatever I try, the problem is in actually keeping it up to date...! Hello! Stupidly I didn't comment properly on your blog I was really wanting to put my two-ha'ppenthworth but got carried away and replied to one of your readers by mistake! Never mind, I'll be dropping by again, because I enjoyed it so much! Well now, I'd hate to have you think that I reckon I've got it all sussed! I know me, and I know what my consistency record is.... but I am starting the right way and hope it continues. Loving my boards. At the moment!! Hello Tilly, thanks for popping by. (I see you know Jo!) There seem to be a lot of us British bloggers with relatives in the Antipodes! And there wed 3 other friends of mine in and around North Island when we were there. They still seem to be enjoying an extended summer out there, don't they? Lucky so-and-so's! Hi Lynne, thank you for popping by my blog and leaving me a nice comment, I'm so glad I found your blog too. Its a possibility I have seen you playing fiddle :-) we are old folkies and have seen loads of dance teams over the years either at music festivals or street festivals. I recognised the name of your team straight away. I don't play anything myself nor can I sing but I have been known to jump up and down in the mosh pit to Bellowhead LOL not a pretty site, I'm not the right shape for jiggin about! Who knows one day we might just bump into each other. Loving reading your blog, think I will start at the beginning. Hi Karen! Great to see you here, and loving your blog. You may have seen OWM at Whitby last year? Cheltenham? I shall be at Towersey later this year.OWM certainly get around! Believe me, I am not the right shape for jiggin' around either...hence I play fiddle and melodeon, not dance! Trite to say, Pen, but there's always tomorrow...and hopefully that tomorrow is better than today!